The second issue from Paulin's Chocolates was issued during the 1928-29 hockey season. While their first set was made up of players from the Western Canada Hockey League, that league was disbanded in 1926. 1928 V128-2 Paulin's Candy Hockey cards feature several amateur teams from Western Canada. In addition to the players, a number of high school, college and women's teams are shown in the set. 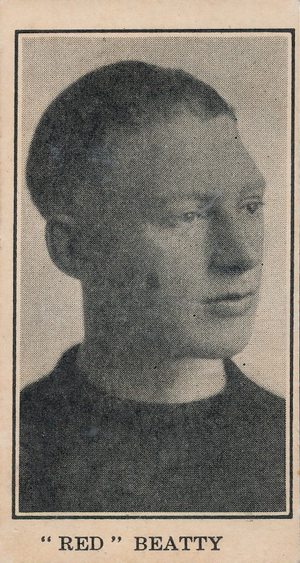 1928 V128-2 Paulin's Candy Hockey card fronts feature a black-and-white player or team photo. A thin black line surrounds the picture and a white border appears around the card. The player's name is listed in the border area underneath the picture, except for Calgary Jimmies players, who are only identified by their team. The backs have a card number and identify the name of the candy. The redemption offer is spelled out; a complete set of 90 cards could be sent to the company in exchange for a hockey stick. The following paragraph addresses female collectors and offers a box of chocolates instead for anybody who isn't interested in getting a stick. An expiration date of June 1, 1929 differentiates V128-2 from the earlier Paulin's set, which had no date at all. Cards that were redeemed were cancelled and returned with the gift. As a result, cards that haven't been punched through or stamped carry a premium over those that were. Cards that are free of wear are very scarce and valuable. As a set of amateur cards, few players are shown that are well-known to hockey fans. Two exceptions are Charlie Gardner and Berg Irving. Largely, the team cards are of interest to collectors as they offer a snapshot of hockey's history. 1928 V128-2 Paulin's #52 Don Cummings NICE!! PSA 1.5 ! 1928 choice playbill Player's Club! FAY BAINTER, WALTER HAMPDEN, etc.